"If everyone had a perfect figure, choosing clothes would be a snap--but most of us have a fault or two that we would like to minimize. It's especially important to know your figure type when buying patterns because you can't try on the dress. Here are new silhouettes - choose the right one for you and walk into spring." Advance Printed Pattern 7917 (sketched left below). The large collar gives width, balances your- bosom and hips (scoop necks are also good). This dress is particularly becoming to the older, fuller figure because of its easy lines. 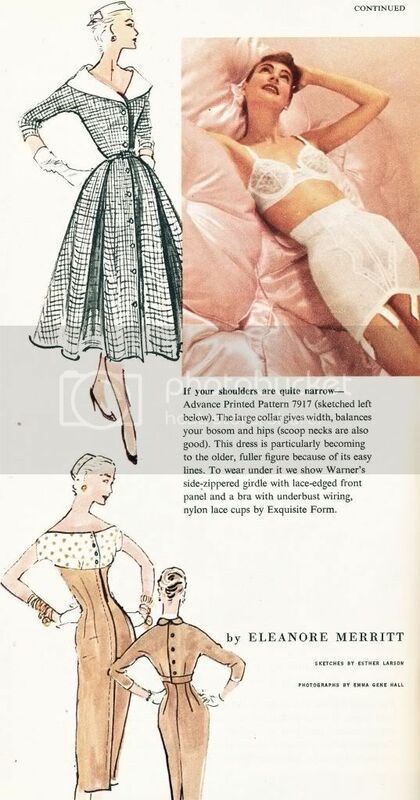 To wear under it we show Warner's side-zippered girdle with lace-edged front panel and a bra with underbust wiring, nylon lace cups by Exquisite Form." Advance Printed Pattern 7918. Empire-waisted dress with back-buttoning bolero. Under it we suggest one of the all-in-ones that are sized for the short-waisted figure." Advance Printed Pattern 7916 (sketched at top). An afternoon dress, sleek and slim through the torso with the fullness swept to the back (wonderful camouflage for a more than ample derriere). 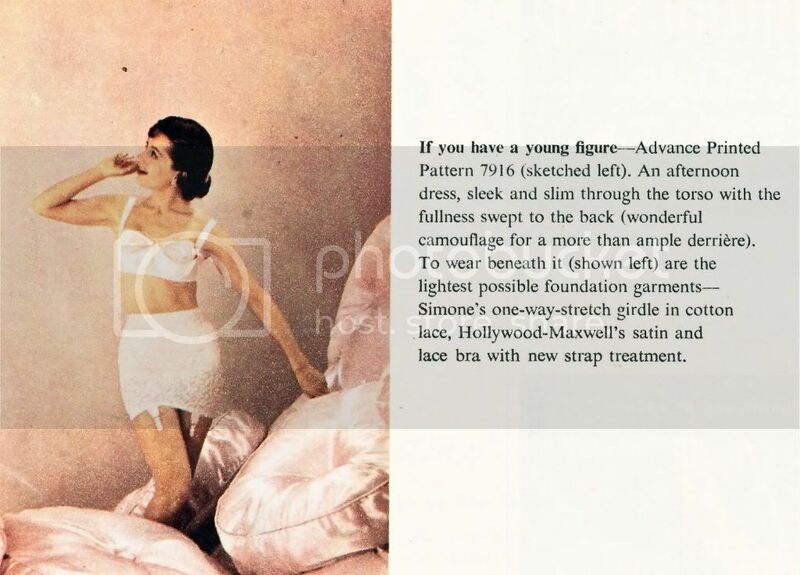 To wear beneath it (shown left) are the lightest possible foundation garments Simone's one-way-stretch girdle in cotton lace, Hollywood-Maxwell's satin and lace bra with new strap treatment." Advance Printed Pattern 7887. Two-piece tunic dress in a dark color. Under it we suggest a girdle with two-controlling panels." Great post! I totally agree with this: my figure type is short. I can't wear long skirts or palazzo pants (maybe with heels). Great article! I'd love to know the number and brand of the leading sketch - I'm in love! It's Advance Printed Pattern 7916. It is pretty wonderful isn't it?